Meet our new latest Joomla 3.3 template - OS Credo. Credo is responsive Joomla template designed for businesses of all kinds and sizes, small, medium and large organizations, e.g. for personal page, portfolio, blog, creative agency or other businesses. Joomla template Credo is clean and minimal, attractive and highly versatile. It comes with K2 (perfect solution to manage your content), Joomla Image Slider (responsive touch screen slideshow), Joomla Photo Gallery (2,3,4 column gallery) and Joomla Google Maps Module in one Quickstart Package. This Joomla template is fully featured with Social Icons, Google Fonts, Price Tables, Drop Down Menus, Multilingual Support, RTL Language Support and more features. Create your awesome business website in minutes! Easy installation in few minutes. Demo data contains complete set of configured page layouts. 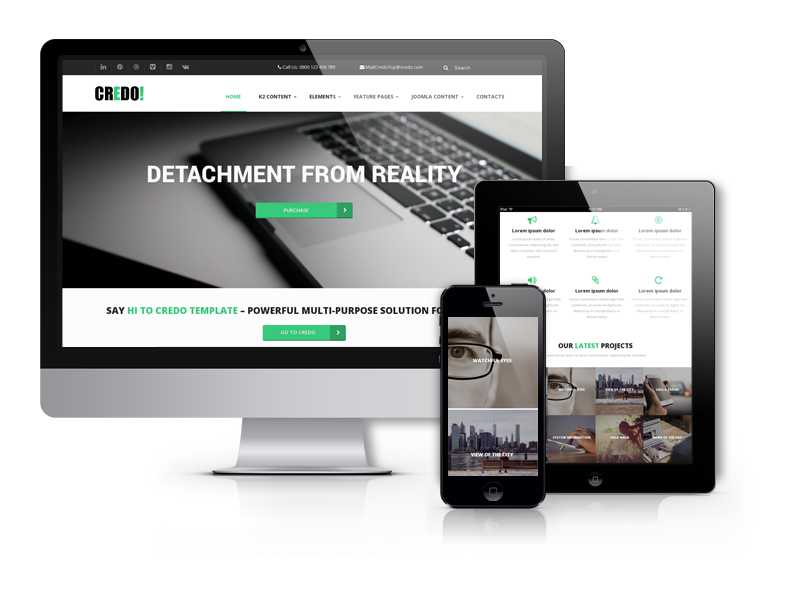 Credo Joomla template fully compatible with all browsers: Chrome, Firefox, Safari, Opera and Internet Explorer 9+. Make your design more attractive with amazing fonts from Google.